The production-ready version of the Ford Mondeo Vignale has been revealed. The most luxurious Mondeo is hand-finished and gets high-quality leather with ‘Tuxedo’ stitching, along with advanced safety technology and superior soundproofing. 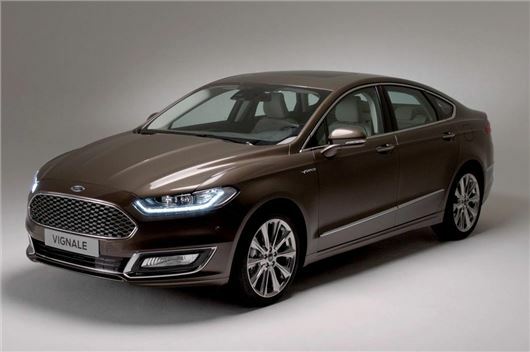 Priced from £29,045, the Mondeo Vignale will available to order from May. The Mondeo Vignale is made at the same plant as other Mondeos but gets finished in a dedicated area, with 100 additional checks by a team of six “master craftspeople.” The interior is upholstered with high quality materials and gets the latest equipment including Sync 2 infotainment and emergency braking assistance. Among features unique to the Vignale is an active sound cancellation system that detects engine noise in the cabin and emits opposing sound waves to keep the cabin serene. There is also acoustic glass and greater sound insulation to reduce noise from outside – and front seat passengers can relax further care of seats with a massage function. Externally the car gets unique details including Vignale specific wheels and colours. Buyers can only get the Mondeo Vignale with high power engines. The petrol option is a 2.0-litre EcoBoost with 240PS, plus there are two 2.0-litre TDCi diesel engines on offer with 180PS or 210PS. Buyers can also opt for the 187PS petrol-electric hybrid. The Mondeo Vignale will only be available at ‘FordStores’ - specially selected dealerships that offer a higher level of service, including collection and drop off for servicing, scheduled to suit the owner. There are expected to be 54 across the UK by the end of 2015, all of which will be more luxuriously appointed with higher levels of service. They will offer Ford Vignale models as well as the flagship new Mustang.